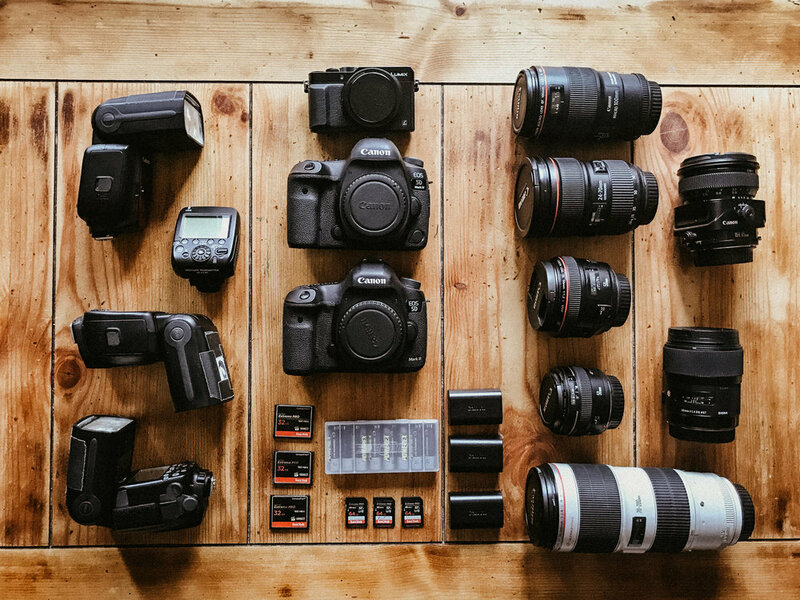 I get asked all the time, "what's in my camera bag?" So I thought it would be a good time to do a detailed post about all my gear, what I use to shoot what and why, and where I keep it all! Camera Bodies - I currently shoot on the Canon 5D MKIV for all my work and have a second 5D MKIII body as an insurance policy in case anything happens to my main camera body. I spend the majority of my time shooting on location, in forests, in the rain, at the beach half submerged in the ocean with waves crashing around me, on cliffs, on dangerous rocks - so it's "safe" to say that there is a high chance I could accidentally drop or destroy my camera during a shoot. It hasn't happened yet (and fingers crossed it never does), but I find it important to have two camera bodies on me when you start booking important jobs. You wouldn't want to have to cut a shoot short because of some sort of technical difficulties. 50mm f1.2 - I love the 50mm as a good all-rounder lens. I find that it's great for portraits, landscapes and simple every day photos. It is such a sharp lens even at f1.2 that I find myself using it a lot!!! 45mm Tilt shift f 2.8 - I am completely in love with this lens. I pull it out when I want to get some creative shots and it never disappoints me. It can make a boring image super interesting! 24-70mm f2.8 - Love this lens cause it gives me a good range throughout a wedding day. 70-200mm f2.8 - I tend to use this lens during ceremonies, especially when they are held in churches. Like that I can still get some closer up shots without being intrusive. Canon Speedlights + Triggers - I use Canon 600ex flashes. I also primarily use my speed-lights when shooting wedding receptions and try to avoid using them as much as I can! I very rarely use them for a fashion shoot, but occasionally it can be an interesting light source to work with. Batteries - It goes without saying that you need batteries to power your equipment! I have two sets of AA batteries to power my speed-light and six Canon batteries to power my cameras. I am used to spending full days (sunrise to dark) shooting on location with no where to charge my batteries if I run out, so I keep a lot of spares on me for these occasions. Memory Cards - With long days of shooting, comes a lot of pictures, so I have quite a few memory cards on me at all times. The 5D mkiii's have a dual slot ability, so to ensure nothing happens to the images I shoot on the day, I have my photos recording to a CF card in the camera as well as an SD card too. So I have two copies of all my images before I even get back to the office! Most of my CF cards are either 32GB or 64GB that I change throughout a shoot when they fill up. I have two 128GB SD cards that stay in my camera throughout the whole day that the CF card photos are backing up to as I shoot. Having large SD cards also allows you to spend a full day shooting, come home, download all your photos, back them up, trash them from your CF cards, but keep them on your SD cards even if you have another shoot the day after. That way you don't need to delete all the original copies of your photos if you don't have the time to double check and make sure they have all downloaded correctly. Twice. FOTO strap - After researching for so long on which camera strap to use, I decided to give FOTO strap a try and I fell in love with it immediately. The strap is comfortable to wear and I love the mint color together with the brown leather. The logo is embossed in the leather which gives it all that personal touch that I always wanted! My Camera Bag - Kelly Moore - Oxford - I have tried several bags before this one and no other gave me the space that I needed with the professional look that this one has. It easily fits my 70/200mm and two other lenses. It has plenty of pockets for my memory cards, cellphone, chapstick or cough drops! It is padded very well. When my camera is in there, I know it's safe. It has a zipper and a fold on top so if it starts raining no water gets in it. It is stylish and functional. Everything I want from a camera bag! Loupedeck is an editing console. I have recently added this to my workflow and I am just completely in love with it! My workflow time is down to half, thanks to the easy to use dials and buttons. Finally, my hands aren’t hurting after editing a full wedding with a mouse. It was very easy to customize, you can upload up to 8 presets! I can’t brag enough about it! Think Tank Rolling case - Airport V3 - I like the fact that it fits all of my equipment and that it's the perfect size for when I travel. The interior is very well padded and they are adjustable so that you can customize the interior as you like. Click on the link (THINK TANK) and you will get a free gift and free shipping!